Publisher’s Note: Tom Console, all on his own, is easily one of the most prolific creators of profitable systems that has ever lived. But when he teams up with another Master, like Bob Shurig, then you know the results are going to be nothing short of sensational! 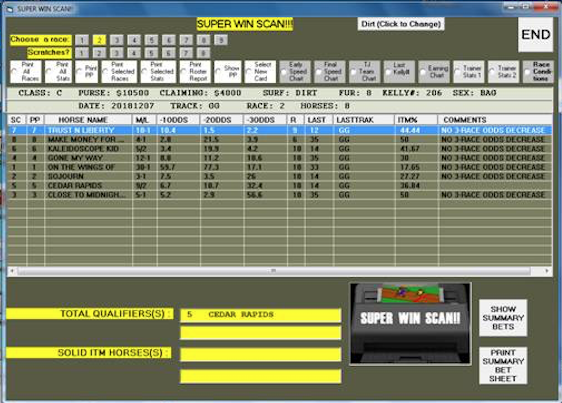 And that’s Exactly what you’ve got in Super Win-Scan, II, a system that basically requires just a few eliminations and BASICALLY JUST A SINGLE RULE! This one is totally worth adding to your handicapping arsenal, as it’s something you can use ‘on the fly’ if you are in a hurry, or incorporate it in with whatever else you are doing. And, BOTTOM LINE, it Makes Money and is Super, Super Consistent. 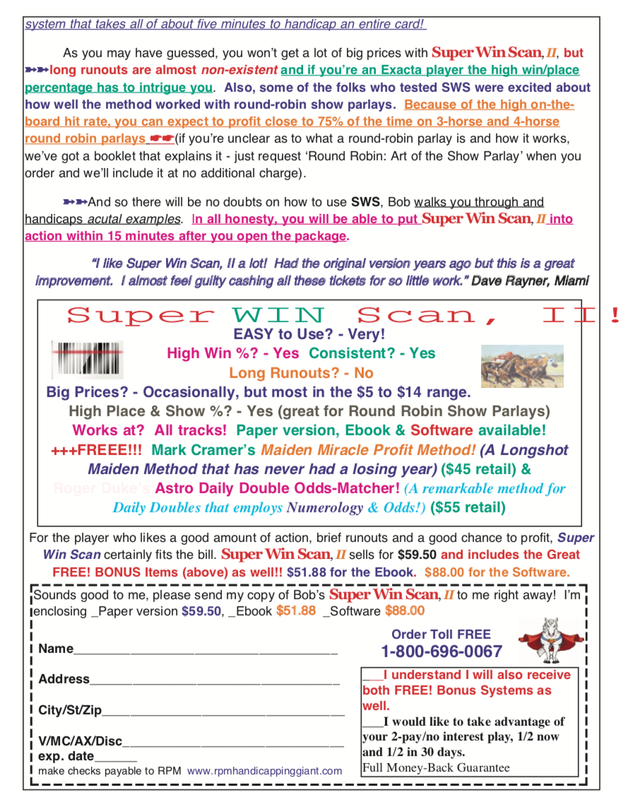 Roger Duke’s Astro Daily Double Odds Matcher! Here’s another very competent observer of Numerology and Numbers Patterns (much like Jerry ‘The Astro Tote Watcher’ Howell), and playing and hitting the Daily Double, with very little work on the player’s part, has never been easier! Check it Out! And, also FREE!! 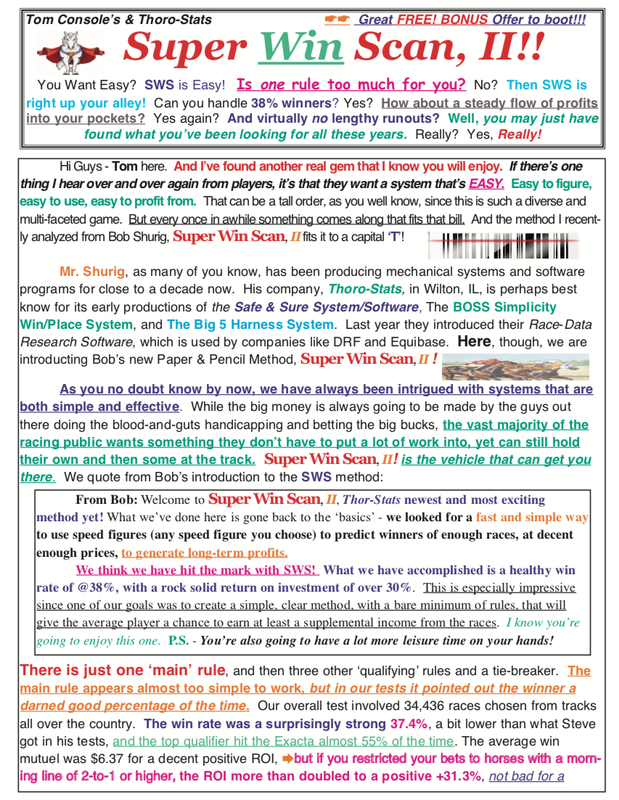 – one of Mark Cramer’s Best Methods ever for Maiden races! So you are looking at a Super-Value Package that will Educate, Excite and Put some Extra Change in your Jeans! Get Yours TODAY!